Earn $29.92 in VIP credit (2992 points)What's This? 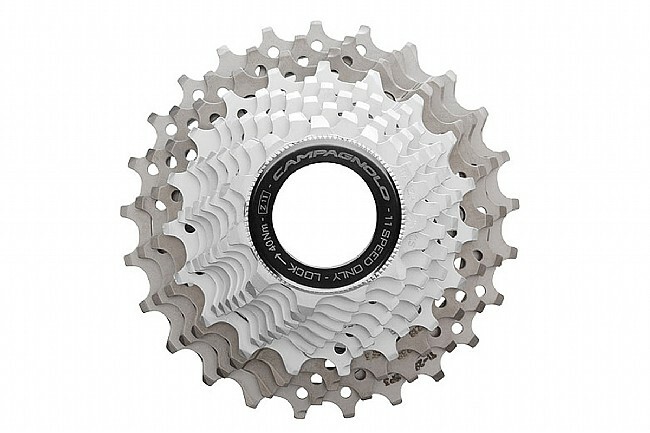 The Record 11 cassette goes for a bit more durability than Super Record with 3 Titanium cogs and 8 steel. The 8 smallest cogs are nickel-chrome coated steel for long life. The 3 largest cogs are Titanium for weight savings due to the slower wear of larger cogs. The 3 Ti cogs are held by a single carrier increasing stiffness dramatically and reducing weight. New tooth profile designed to shift flawlessly with the Record 11 speed chain. Alloy lockring included. Top function, a bit lower in price than Super Record. Have bothand cant tell the difference on the road, dirt or pavement. Lasts and lasts, too. BTD makes it affordable! Smooth and quiet extremely well made. Topical campy high quality. Smooth and quiet extremely well made. Typical campy high quality. Ok, it's hard to justify the price when comparable products from Shimano and SRAM are considerably less expensive. But the other brands can't match Campagnolo's build quality or silky-smooth operation. Even with the titanium sprockets, the cassette seems to last well. I lube my chain regularly, keep my bike fairly clean, and replace my chain at least once during the life of the cassette, and I usually get at least 10k miles out of the cassette.